With just a few days to go before our holiday the fresh contents of the fridge were run down to almost zero … but we still had to eat. Half a dozen tomatoes and some sad looking carrots were all I had left, after which we would be on to frozen and tinned vegetables for the last day or so. Then I remembered this recipe on a card I had picked up in the supermarket a few weeks before. It was just the right dish to serve with Marinaded Pork, oven tomato roasted tomatoes and some crusty French bread (flatbread or pittas would have been another option). The recipe card for Indian Chicken with Carrot & Chickpea Salad came from Tesco supermarkets. The chicken is pre-marinaded and then simply grilled or fried – something to make on another occasion. The salad was prepared as instructed by the recipe except I halved the quantity of carrot to serve three/four whilst still using a whole can of chick peas. I would have liked to add more mint but there was not much in my garden – well, I was just about to go away and I do use quite a lot – however the 2-3 sprigs I used was adequate. I am not sure that this would be enough to serve six unless it was with another vegetable or salad side dish in addition to the rice or bread recommended. Our verdict on the recipe, however, was a resounding ‘more please’ so I shall be making this again. At some point I will certainly be trying it with a tikka style chicken recipe as suggested by the original card date. 1. 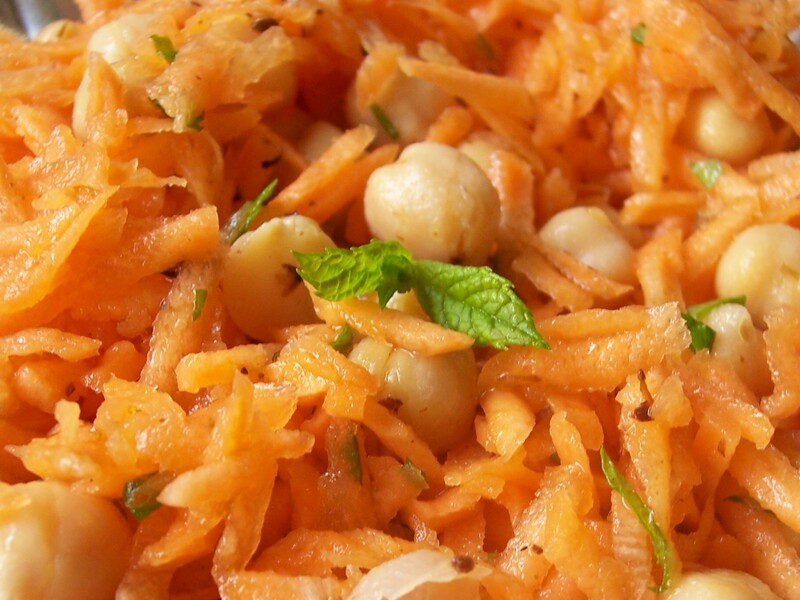 Put the carrots, chickpeas, honey and olive oil together in a bowl. 2. Heat the coriander seeds in a dry frying pan and toast until they start to release their aroma. 3. Add the toasted coriander seeds to the bowl. 4. Stir in the lemon juice to taste – less than the specified quantity may be enough. Add the mint and season to taste. 5. Serve with grilled or cold meat. Original recipe was served with spiced chicken. flatbread, mango chutney and Indian beer. 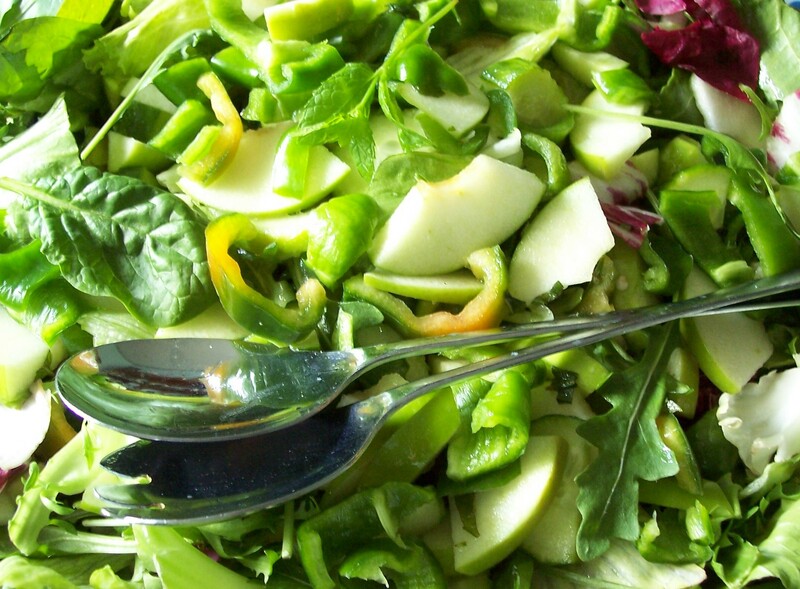 This salad was made as a contribution for a shared supper with a group of friends. I was asked to bring a green salad, so set about putting together a mixture of green salad and fruit items (although there were some dark red radiccio leaves in the mixed salad and the green pepper was slightly turning to orange/yellow.) I used cider vinegar in the vinaigrette dressing as it complemented the sharp tasting green skinned Granny Smith apples. Although they are sharp they add a sweetness and this can be increased by adding grapes. Alternatively, green olives could be added to give a more salty flavour, although I did not add them on this occasion. The whole salad was well received and one friend in particular was very complimentary. I shall certainly be making this again. As you might have gathered, this recipe is my own concoction, probably not very original but still was not copied from another source. Pork and apple complement each other well and this would be particularly suitable to eat with cold ham or gammon, pork, pork pie or a pork based pâté. 2. Slice cucumber in quarters lengthwise and chop. 3. Chop and prepare other items as required and combine in a large bowl. 4. Mix the dressing in proportion of 2:1 (oil to vinegar) add a little black pepper and whisk together thoroughtly. 5. Shortly before serving, pour the dressing over the salad and toss lightly together.